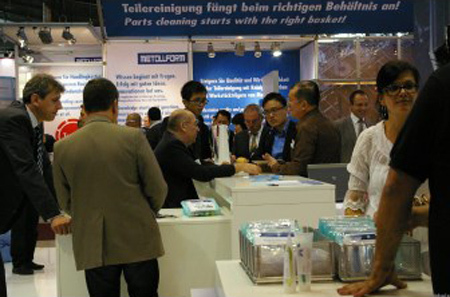 parts2clean 2013, which ran from 22 to 24 October in Stuttgart this year, boasted 264 exhibitors, which is a 15% increase from 2012, and is an all-time record for eleven seasons. The total visitor count was 4,982, up just on 14% from 2012. The highlight of the exhibition was a bilingual expert forum, attracting a record-breaking 2,181 participants. According to the organizer Deutsche Messe, about 90% of the visitors at parts2clean have input into their organizations’ capital investment decisions, and this is reflected in the largely project-specific dialogue that characterized discussions at the display stands. This year is the second time that the tried and proven expert forum has been held on a bilingual footing, with simultaneous translation of all presentations from German to English and vice versa. “The fact that participant numbers have grown nearly 24% to 2,181 reflects the strength and depth of interest in knowledge-sharing in the international industrial parts cleaning industry,” said Olaf Daebler, Deutsche Messe’s director in charge of parts2clean. In 2014, parts2clean will be held in its new, mid-year slot – from 24 to 26 June – in Stuttgart, Germany, and will thus be co-located for the very first time with O&S, the international trade fair for surface treatments and coatings, LASYS, the international trade fair for system solutions in laser material processing, and the AUTOMOTIVE Expo, a suite of shows dealing with various aspects of the automotive industry.